Our sampler of new Gallic short cinema, presented in collaboration with UniFrance, celebrates its fifth edition this year with a selection of animation, comedy and drama, including films from Cannes and Sundance, the winner of the Best Short Film at Venice and an animated film nominated for this year’s Oscars. Two filmmakers return to the lineup with new work: Venice winner Céline Devaux, whose break-up drama YOU WILL BE FINE is told using live-action and her signature animation seen in Sunday Lunch (screened in the 2016 edition), and Wei Hu, who follows up his Academy Award-nominated Butter Lamp (also in the 2016 selection) with WHAT TEARS US APART, a cross-cultural tale featuring Isabelle Huppert. Other notable French stars in the program include Catherine Deneuve, cameoing as a fairy in Axel Courtière’s fantasy DELECTABLE YOU, and Vincent Lacoste, starring in Antoine de Bary’s BIRTH OF A LEADER. GRANDPA WALRUS (Pépé le morse, dir. Lucrece Andreae, 15 min., animated) Official selection: Cannes Film Festival; Audience Award, Annecy International Animation Film Festival. Visiting a windy beach to remember Grandpa, Grandma prays, Mom screams, his sisters don’t give a hoot, and Lucas is alone. DELECTABLE YOU (Belle à croquer, dir. Axel Courtière, 15 min.) In this stylized fantasy, a gourmet cannibal burns with love for his neighbor—but she’s vegetarian, while he has a severe case of vegetable phobia. Things take a drastic turn the evening she invites him to dinner. Featuring Catherine Deneuve. YOU WILL BE FINE (Gros chagrin, dir. Céline Devaux, 15 min.) Best Short Film: Venice Film Festival. Jean celebrates his birthday, gets drunk and recalls the dreadful weekend that led to his break-up with Mathilde. BIRTH OF A LEADER (L’enfance d’un chef, dir. Antoine de Bary, 15 min.) Official selection: Critics Week, Cannes Film Festival. At 20, Vincent is a successful actor, just cast in a biopic about the young Charles de Gaulle. But his parents are leaving Paris, so Vincent has to live on his own for the first time—a daunting and lonely prospect. Starring Vincent Lacoste. WHAT TEARS US APART (Ce qui nous éloigne, dir. Wei Hu, 19 min.) Official selection: Sundance Film Festival, Venice Film Festival. After a long separation, parents are reunited with their daughter, now a mother herself. Featuring Isabelle Huppert. NEGATIVE SPACE (dir. Max Porter and Ru Kuwahata, 6 min.) Academy Award Nominee, Animated Short Film. A tribute to a father who taught his son how to pack. Filmmaker Ru Kuwahata in person for Q&A. 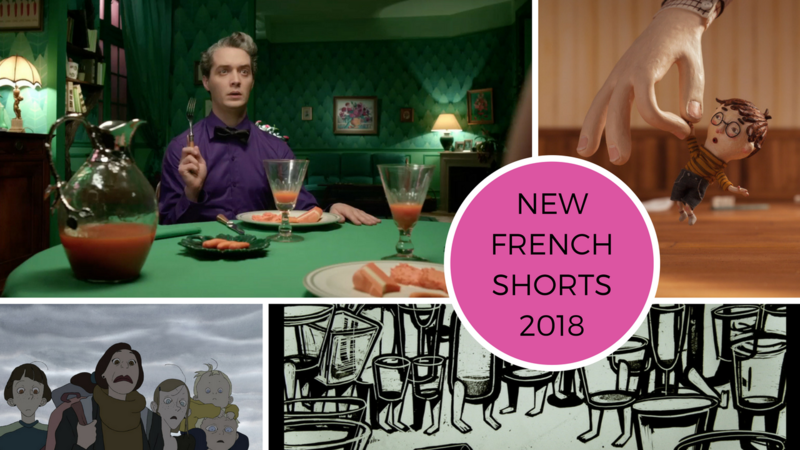 Presented in collaboration with UniFrance, the showcase coincides with the eighth edition of its MyFrenchFilmFestival, a worldwide online film festival streaming narrative, documentary and animated features and short films (including BIRTH OF A LEADER and DELECTABLE YOU) through February 19, with films subtitled in 10 languages. The program’s GRANDPA WALRUS, WHAT TEARS US APART and YOU WILL BE FINE are also part of the traveling program Young French Cinema, distributed by UniFrance and the Cultural Services of the French Embassy to theaters and cultural institutions throughout the US.